Another good self-inventory exercise came in the form of the TED Fellows application. One of the questions was, if your close friends could describe you in 3 sentences, what would they say. I sent this question to a bunch of close buddies. The feedback was flattering. Return to lesson from earlier post: the energy you put into the world is the energy you get back. Later in the year, I had a chance to visit my sister’s father in law in Rome where I understood something else about my nature. I only had a few days – it was my first trip to Rome. He asked what I planned to see. Two answers: the Vatican and Antonio Canova’s old workshop. Item number 2 stopped the conversation and turned heads, after all who goes to Rome with the pure intent of seeing Canova’s workshop turned cafe? A flickering smile came across his face, “ahhh, you’re a romantic, just like me.” So I’m a romantic, not a donut. I asked him for his advice, to which he replied, “oh its very difficult,” and shook his head. He actually used the French term “dur” which means difficult plus concrete and brick walls. 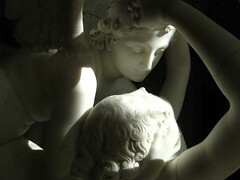 This explains, amongst other things my enamor with Canova’s sculpture Psyche and Cupid, above. Art is art when it expresses those moments that words fail you. That’s what this piece does for me.